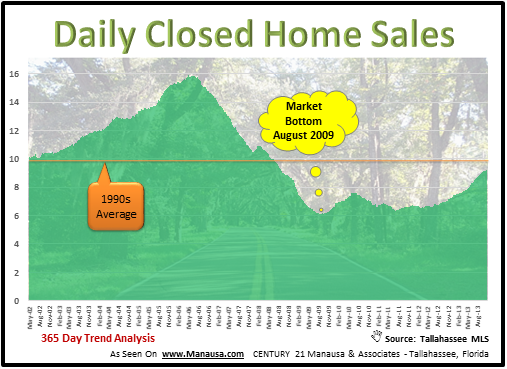 We have published numerous posts and reports to show the improving conditions in the housing market, including the fact that home sales by Tallahassee Realtors are up 31.5% in the past 365 days. But what does that really mean? What is the impact on people who need to sell a home? How about people who want to buy a home? Well, let's take a closer look. The reason that we are specifically identifying the source of the information in this report is because we typically utilize two separate sources of data on house sales. 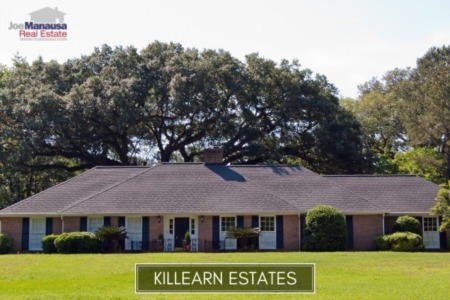 We track everything in Leon County as reported to the Property Appraisers office, but we also track property sales in the Tallahassee Board of Realtors Multiple Listing Service (the Tallahassee MLS). 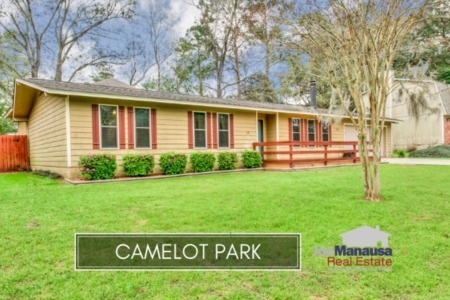 The MLS is a subset of all sales in Leon County, but it is the only source of data the contains both supply (the homes for sale in Tallahassee) as well as demand (the houses that have been sold). County records are more complete (includes homes sold without a real estate agent), but there is no corresponding list of everything for sale, so we need the Tallahassee MLS to determine supply and demand ratios for all price points and areas in Tallahassee. 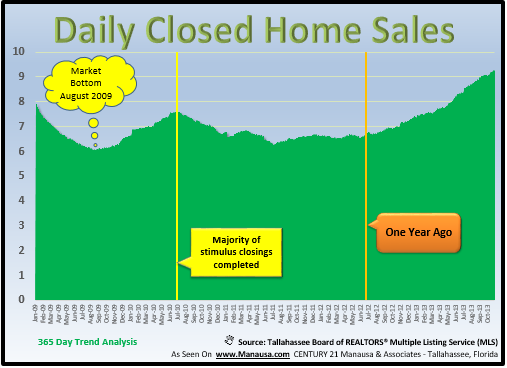 The real estate graph below shows the 365 day trend (daily average) of closed home sales in Tallahassee. The orange line in the graph shows the average number of daily closed home sales in the 1990s (and arbitrary figure we use as a baseline) and thus the graph shows how the market surged 60% during the boom, and has since been reduced significantly for the recovery. Here are the thoughts that occur to me when I look at the graph above (as well as the one below which is a magnified view of the above information). While sales have rocketed 31.5% over the past year, the number of homes selling is still consistent with what was recorded in the 1980s. Tallahassee was 30+% smaller in the 1980s than it is now, thus current home sales should be significantly higher due to the higher number of homes and people in Tallahassee. Were it not for the boom, current home sales would be much higher. Thus when the recovery has completed, we should expect home sales to far exceed the orange line on the graph above. If the rate of growth in home sales continues, we should be well above the 1990s average sometime early next year. If it continues. We know that our growing population has got to live somewhere. The larger we grow, the more homes that we will need and thus the more home sales that will be recorded. Even if the trend moves towards renting, there will still be home sales that exceed current levels. But in the short term (meaning the next five to ten years), we have to anticipate increasing mortgage interest rates. This will have a negative impact on home affordability, and we will see the greatest impact at the higher price ranges. The big variable is when will interest rates rise? As long as they stay low, we will see the market continue in its recovery at all price points. But homeowners who want to sell should keep interest rates in mind. If they were to shoot up significantly, we will see average home prices fall (not necessarily home values fall though). This means buyers will be pushed down in price ranges, and thus supply and demand for homes in the luxury home market (and immediately below) could be in a tough situation. Median valued homes will continue to appreciate, it will just be a different income-level buyer that will be purchasing them. Ultimately, we are awaiting a hammer blow to the market that will change the rate of recovery significantly. When the Fed ends QE and the capital markets start fending for themselves, we will see mortgage interest rates finally rise and the next housing bubble will commence. I doubt we will see much impact from this bubble on homes below $250,000, but for homes for sale above $400,000, it could be worse than what we observed since 2006. Remember, this is not a cash-laden town, so buyers in all price ranges rely on borrowed money when they buy a home in Tallahassee. When interest rates double, home affordability is slashed. That means the demand (number of qualified buyers) at the higher price points is greatly reduced. Now is a great move-up time if you plan to be in Tallahassee for quite a while. Get the big home, lock-in a 30 year fixed low-interest rate loan, and enjoy the best home affordability that Tallahassee is likely to ever see again. If you own a big home and know you will want to sell in the next few years, consider down-sizing now or re-financing now. If you sell and take the hit now, it might just be less painful than if you are forced to sell after interest rates return to "normal" levels (current 50 year average is at 8.5%). If you choose to refinance now to take advantage of low rates, you can always rent your home out rather than sell it for a loss. Regardless of what you do, think it through now and decide now while mortgage interest rates are low. If you would like help in assessing your situation and how my group of Tallahassee Realtors can walk you through the process, then simply drop me a note and we can schedule a convenient time to review your options.